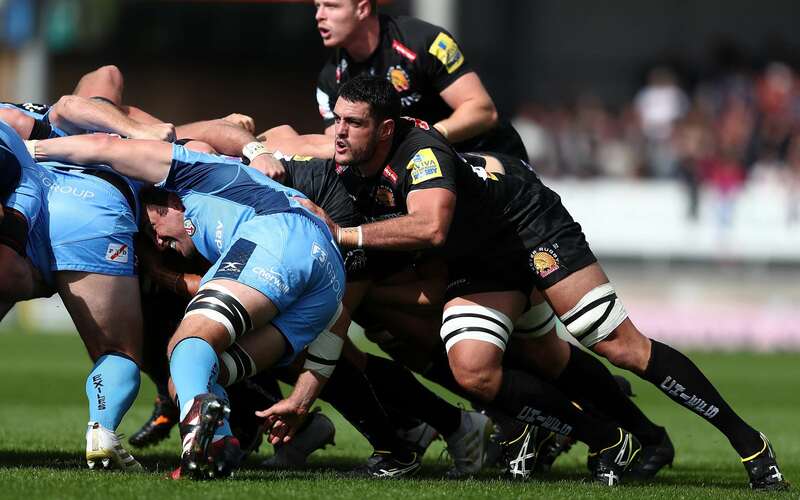 Dave Dennis insists he will be looking to make up for lost time as he edges ever closer to returning to full training with Exeter Chiefs. The Australian international endured a frustrating campaign last season as he was restricted to just 10 appearances in all competitions due to injuries. That all came after an impressive first year in Devon where the experienced former Waratahs forward helped his new club to lift the Premiership title for the first time in the club’s history. A torn bicep sustained in training meant the 32-year-old’s season was disrupted early on and would keep him sidelined until January.However, things would not get any easier for the former Wallaby, who then picked up a knee injury that kept him out for a further two months. Dennis finally returned to duty to feature in both the semi-final and final of the Anglo-Welsh Cup, which the Chiefs won for the second time with victory over Bath at Gloucester in March, but could only watch on as his team-mates advanced to the Premiership Final for a third year on the trot, only to be downed by Saracens in the end of season showpiece at Twickenham. Now, having had summer surgery to address the knee injury that hampered him last term, Dennis is relishing the chance to get back playing and helping the Chiefs to attack the 2018/19 season. “I couldn’t find my rhythm last season and it tends to go like that,” said Dennis. “In my first season, I didn’t miss a game (through injury) and played around 27 matches, which was fantastic, but last season was unfortunately a big stop-start for me. True to his word, Dennis has been head down for the past few months, working tirelessly on his rehabilitation programme and getting himself fit for duty. It’s a similar position for a number of the club’s other first-team stars, including the likes of Jack Nowell, Mitch Lees and Max Bodilly, who are also battling it out in the Sandy Park gym in their bid to get fighting fit. The ultimate goal, though, is to be ready for that seasonal opener against Leicester Tigers in the Gallagher Premiership on Saturday, September 1 at Sandy Park. “It’s going to be good to get tested nice and early in the season,” said Dennis. “The beauty of the season here in England that I enjoy is that it is quite seasonal weather wise, so we are going to be playing some top, attacking teams in September when it is going to be quite dry, with fast tracks, and those will be really exciting games to play in, and as a a club and a fan base, we should be really excited about that first month of fixtures. “As the season progresses, there are other nice opportunities to have some special games. Christmas is always really nice and last season the New Year’s Eve game with Leicester was an amazing match.We are playing Saracens the weekend before Christmas, so that is going to be a real festive occasion, so it is exciting. “Bristol coming back in will be exciting as well, and I think Gloucester will be really strong this season with the recruiting they’ve done.